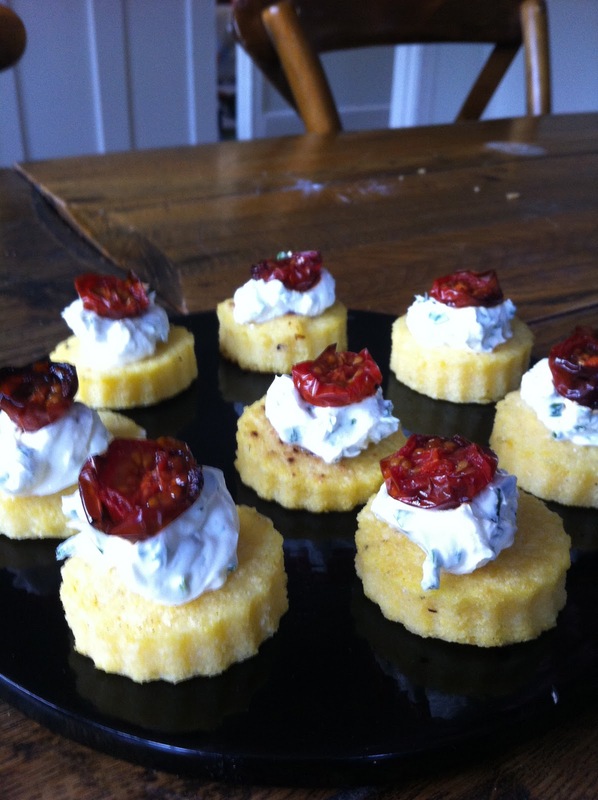 Aga Girls: Polenta, goat's cheese and roasted cherry tomato canapes. Polenta, goat's cheese and roasted cherry tomato canapes. Bring the polenta up to the boil in the water and then reduce to a simmer. If you aren't cooking for a vegetarian you can use chicken stock instead of water. Stir occasionally if you don't have quick cook polenta this should take about 15 minutes until you have a porridge like consistency. Spread the mixture out on a roasting tin until it is just under a cm thick, leave to cool. Once cool is should be solid and can be cut with a pastry cutter. Fry the rounds until they crisp on the outside. Chop the herbs and mix them into the goats cheese. Season add lemon juice if you think that you need to slacken the mixture off, this really depends on goats cheese which you use. Cut the cherry tomatoes in half, drizzle with olive oil and roast at 160C for about 30 minutes until they resemble sun dried tomatoes. If you don't have time to do this you can just use sun dried tomatoes instead. This can all be done and assembled well ahead of time. Serve at room temperature. Fruit tart with lemon and marscarpone.